Plastics #1 & #2 - with neck or handle. Check bottom for number, remove lid, rince & flatten. 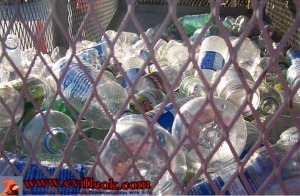 Glass Bottles - clear, brown and green only. No plate, pyrex or other glass accepted. Office Paper - includes envelopes. colored paper and junk mail. Magazines - up to one-inch thick, catalogs ok.
Motor Oil / Antifreeze - up to 5 gallons per person per day. No mixed fluids or gasoline accepted. Drop off during attended hours only. Batteries - household and auto. Not Accepted: commercially-generated waste, hazardous materials, appliances, tires, cardboard or tin. Some bins are locked when the site is not attended. Some items can be left after hours in small polycarts for later sorting. City, M.e.t. 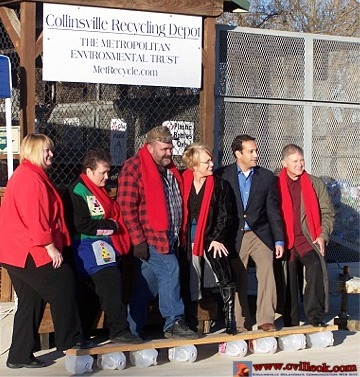 and Res Care officials flattened plastic bottles to mark the grand opening of the new Collinsville facility Monday Dec. 3, 2007. 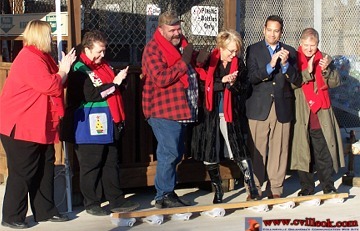 L-R: City Commissioners Melodie Bateman, Pam Porter and Trent Rogers; City Manager Pam Polk; Mayor Stan Sallee and David Turman of ResCare. Julie Alexander of the M.e.t. was not in the photo.